Tempest and Slaughter was my first Tamora Pierce novel, and I loved it. The story follows protagonist Arram Draper, a gifted 10-year-old mage whose power rivals even that of students almost twice his age at the prestigious Imperial University of Carthak. But when his lack of training eventually leads to the accidental flooding of a classroom, it is swiftly decided that special arrangements must be made for Arram. Suddenly, he finds himself transferred amidst a cohort of older students, to be given private one-on-one instruction by no less than five masters at the school. The special treatment results in Arram being ostracized by the other children, though he does end up making two very close friends, both of whom are also in the fast-tracked program. The first of them is his roommate Ozorne, an heir to the throne of Carthak (though there are seven others ahead of him in line, earning him the nickname of the “Leftover Prince”). And then there’s the kind and charismatic Varice, an intelligent and hardworking girl who loves cooking and working with potions. The three of them become inseparable, and even talk about the future when they will all fight by each other’s sides to protect their kingdom from the constant threat of war. But the more Arram learns in his lessons, the more uncertain he is that this is the path he wants to take. While there is glory to be had on the battlefield, his true passion lies in the less martial forms of magic. As the years pass, Arram also feels his relationships with his friends changing. He begins falling for Varice, though he has no idea whether she feels the same about him. Around the same time, a series of accidents and tragedies befall the royal family, putting Ozorne closer to the throne. It makes Arram’s heart break for his friend because he knows the crown is not what Ozorne wants. Still, the prince needs the support of his companions now more than ever, and one of Arram’s best virtues is his loyalty. Arram eventually grows up to become the powerful mage known as Numair Salmalín, a character who apparently features prominently in a lot of Tamora Pierce’s books set in the Tortall universe. But in Tempest and Slaughter, he is still just a young boy, and the series is supposed to chronicle his early life. Most of this first book is taken up by why goes on in his various classes and the amazing things he learns from his teachers, and unsurprisingly, like most “magic school” narratives for young adults, I found many of its themes to be very Harry Potter-like in their execution. It’s also a bit of a slow-builder, with no overarching conflict for much of the story. Instead, the earlier sections of the novel are presented as a series of Arram’s experiences with magic, and many of the challenges he faces are those related to the day-to-day life of being a student. This includes everything from the mundane (like trying to pass exams, make new friends, or dealing with bullies) to the more magical (such as crafting magical jewelry or mastering mage circle techniques). As well, there are plenty of unexpected delights to be found in Arram’s lessons, such as getting to meet a crocodile god while learning to traverse underwater, or having to take responsibility for raising magical animals. Despite its somewhat rambling nature, I still very much enjoyed following Arram’s story. As interesting as his lessons were, my favorite part was reading about his interactions with Ozorne and Varice. The three friends come from very different backgrounds and have a lot to teach each other as they grow from children to young adults. Matters of puberty are addressed as Arram becomes more conscious of his changing physiology and emotions, even as his heart grows fonder for Varice. Meanwhile, Ozorne also grows increasingly anxious and moody as, one by one, the heirs before him are picked off by misfortune, leading Arram to begin questioning his future with the young prince. Besides his friends, our protagonist has also bonded with others outside the university, including a gladiator slave whose harsh life has opened Arram’s eyes to a lot of the poverty and injustices occurring in the city. These sections highlight Arram’s innocence by exposing him to the more brutal ways of the world, but they also show he has a compassionate side and a strong sense of decency. I’ll be honest here; not much really happens by the end of this book, but I think the author’s powerful character study of Arram and the intimacy of his tale will go a long way in making up for that lack of story progression. Throughout it all, I never lost interest. If anything, my curiosity about the book’s world has only grown, and I find myself wanting to read more of Pierce’s work. Perhaps I’ll take a look at her other series set in the Tortall universe while waiting for the sequel. Audiobook Comments: Ari Meyers is a new narrator for me, and although I couldn’t find too many audiobook credits to her name, her performance sounded experienced enough and I also thought her voice well suited to portraying the many young and diverse characters in the story. Looking at the cover, I’m thinking: yes, this is a YA title, but probably not going to be a title for me. Then I read the back of the book and your review and now I’m thinking: yes, this book is totally for me! I still like to believe that there is a magic school out there, but that magic world is different, and somehow we don’t start until we’re middle aged. It’s like, middle age crisis got you down? Don’t worry! You’re actually going to learn to be a mage! I am REALLY struggling with this. It’s so boring right now, and the fact that there isn’t really much else that happens by the end of the book does not make me want to keep reading. I’m sad, I thought I’d love this book! But it feels so young and the “puberty” parts your talking makes this feel like it’s geared toward 11 year old boys. I know what you mean! It took me a while to get a hang of this book because literally “nothing” happens for so much of it. Yes, Arram gets to do and see all these amazing things, but the story/plot itself really goes nowhere. My enjoyment came from the magic of being in a school for mages, but I can see how that might not be as satisfying and why you would want more. I hope it gets better for you! Sounds like you really enjoyed this one. I have some books by this author but have never read any. Sounds great!! I always liked Numair and really want to read about his childhood, very excited! Even though it doesn’t sound very action packed, i’m sure i will enjoy the setting & writing! I think this one would be excellent for readers with knowledge of her other books and characters, especially if you are already familiar with Numair! You get to find out lots about him! I don’t think I’ve read a Tamora Pierce novel but I’ve heard such great things about her books! She is a classic in YA fantasy so I’ve always wanted to give her books a shot. I’m glad you enjoyed this new one! Great review, Mogsy. I like how you analyzed the audio quality! Thanks! 15 hours audio! I’ve never listened to audio books so far as they would need all my attention and I would feel weird looking …nowhere. How did you do it? That being said I love your review and the slight similarities yoy state with Harry Potter. Okay, this is one I need to read. I wasn’t a huge fan of Numair when I first read The Immortals books, but I’d like to jump back into Pierce’s stories. I really enjoyed them back in the day. Me too. It’s highly possible I will. Huh. I knew this book was set somewhere in Pierce’s Tortall universe, but I didn’t realize it chronicles part of the boyhood of a character she’d already created. The only Pierce books set in Tortall that I’ve read so far are her Song of the Lioness series… and since Numair doesn’t appear in that series, I’m guessing he must be in the Immortals books. 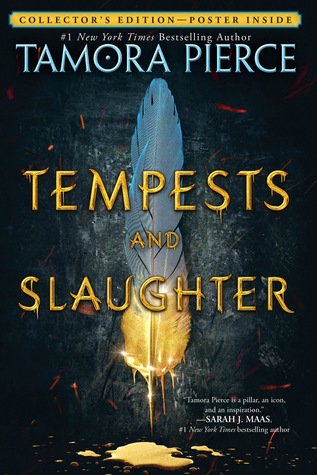 But it might be a good thing to read Tempests & Slaughter first, in that case. Yep, I think I read somewhere that Numair is the main character of the Immortals series. He’s like the chief mage of Tortall or something? So this is the story of his childhood, and apparently it establishes some of the other characters in the other series and explains some of Numair’s relationships with them, etc. I’m definitely intrigued enough now to consider picking up The Immortals! I’ve not read anything by TP yet and I’ve been eyeing up this book as maybe the place to begin so it’s great to see you loved it. Definitely going on the list – even if I shouldn’t be adding anything at the moment.